Pack size: 3 x 120ml bottles. Boston Simplus has been discontinued and is no longer available. We recommend Regard K RGP contact lens solution 3 Month Pack as a replacement. Contact lenses are so practical, especially for those that love to enjoy an active life, taking part in various activities. They can also help enhance your natural appearance and you'll enjoy great vision while wearing them. Taking care of contact lenses can be time consuming and the non-disposable types require a specific routine that can't be neglected if you want to maintain good eye health and keep your lenses in the best shape and condition. The Boston Simplus solution takes the hard work out of the lens care routine. With Boston Simplus, you can cleanse, disinfect, condition, rinse, wet and remove proteins from your gas permeable contact lenses. It also cushions them, keeping the lens comfortable on the surface of your eye. 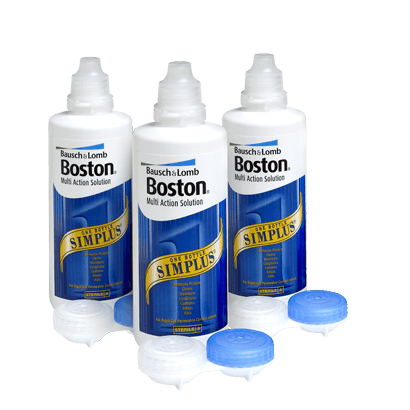 Baush & Lomb Boston Simplus lens solution is so convenient that all you have to do, once you've removed them, is place your contact lenses in their case and make sure you cover them completely with the multi-purpose lens solution. It's that simple. Leave your lenses in their case overnight and the solution will take care of all necessary steps. In the morning, remove your lenses from the case and rub them, before rinsing. These easy steps are all you need to do and your lenses will be ready to insert again for another day.